The romantic white decor of the Banqueting Hall with beautiful Garden Room is the perfect setting for your wedding ceremony, reception, christening or special party. 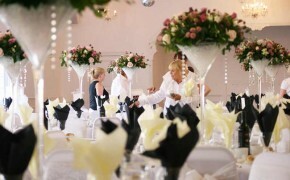 The hall has a staffed private bar, secluded garden area and modern white décor. Our beautiful Garden Room allows for extra seating or wedding ceremonies. We have a black & white floor & wooden dancefloor. There is a stage at one end of the hall and black granite bar at the other. Patio doors run the length of the room into the garden where you can have a bouncy castle hog roast or BBQ. Our Bar Managers are on hand to assist you throughout your event and meet and look after your guests. The hall is the perfect setting for any special occasion. We are licensed till 1am on Friday’s & Saturday’s, 12.30am on Sundays and 12am Monday-Thursday. Bromley Registrars are able to offer late night wedding ceremonies up until 8pm in the evening. Imagine a ceremony by candlelight! Newly built in 2017 – Pergola licenced for outside wedding ceremonies. Newly laid astro forever green grass in April 2018. For the full price list please email or call for more information. Please note that in addition to the hall hire fee a minimum bar spend also applies. Please let us know if you may prefer our ‘dry hire’ option if your guests drink little or no alcohol. For a display of photos of our Banqueting Hall & Garden Room, see the left hand column on this page and click ‘The Banqueting Hall Gallery’. If you would like to know what a wedding at Club Langley is like – go to YouTube ‘Andy Bird Club Langley’. Andy Bird Videos have very kindly filmed a wonderful promo video for us. This was shot on a beautiful sunny day in May 2014 with the lovely Davinia & Ronny. Below that you can find the wedding of Carole & Michael, an amazing couple that married here in September 2014. We regret, our licence does not permit us to hold any birthday parties between the ages of 11 & 21 at Club Langley. We can seat from up to 180 guests in the Banqueting Hall with an additional 90 in the adjoining Garden Room or up to 400 for drinks and canapés (using both rooms). The hall is an impressive 31ft wide and 82ft long. Your guests will arrive through the garden entrance and can be served drinks on arrival by our smart and friendly staff. Please see our 'Frequently Asked Questions' page for full details and conditions for this hall. We can provisionally hold a date for 24 hours then 50% of the hall hire fee is required to secure your chosen date. Payment can be made by cash or card. A booking form will need to be completed in person and also one of our membership forms. We will also need photo ID such as your passport or driving licence and proof of your address such as a utility bill. The full balance of hall hire is due three months prior to your event with all remaining balances due 6 weeks prior.